From hundreds of nominees and dozens of finalists, our judges had the monumental task of selecting just one winner in each category. SeniorHomes.com, an online directory and resource for seniors and their families searching for senior care or senior housing, has announced the winners in its second-annual SeniorHomes.com Best of the Web Awards. The SeniorHomes.com 2012 Best of the Web contest aims to identify the most valuable resources across the web for seniors, caregivers and industry professionals in numerous categories. Winners in each of the ten categories were chosen by a panel of leading experts in the senior living industry. In addition, SeniorHomes.com is recognizing popular vote winners with first ever SeniorHomes 2012 Best of the Web Peoples’ Choice Awards. Social Media Rockstars – Individuals – Eleanor Barbera, Ph.D. Winners were selected by a panel of 19 judges hailing from all corners of the industry. This year’s panel includes Patrick Roden, CEO of AginingInPlace.com, Deeena Neste, founder of Mature Market Sales Source and Jaclyn Allmon, manager of Internet Marketing for ALFA, among others. The nominees with the most cumulative Google+1s and Facebook likes in each category have been deemed the People’s Choice winner by popular vote. Among the hundreds of nominations received during this year’s contest, each and every one is deserving of an award. 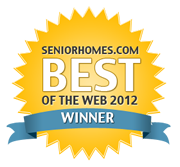 Be sure to visit the SeniorHomes.com 2012 Best of the Web Awards contest page to review every nominee and finalist.